The photo above is of is the Eagle Bluff Lighthouse near Fish Creek in Door County. 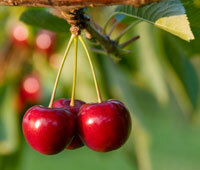 The photo was taken by my colleague at University of Wisconsin-Madison, Lori O’Neill. My series character, Ava Oosterling, operates a copper-kettle fudge shop on the docks of Fishers’ Harbor, facing the Green Bay side of the peninsular county that forms the “thumb” of Wisconsin in Lake Michigan. You’ll find FABULOUS FUDGE RECIPES within the pages of all my books in the Fudge Shop Mystery Series from Penguin Random House. 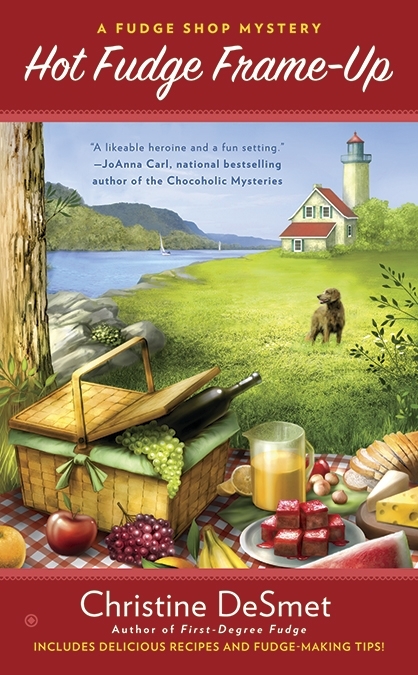 First-Degree Fudge was on the Barnes & Noble mystery bestseller list for 10 weeks when it debuted in Fall 2013. In First-Degree Fudge, Ava is accused of murder—by fudging with her fudge recipe! After a visiting Hollywood star chokes to death on Ava’s new flavor, “Cinderella Pink Fudge,” diamonds are discovered hidden in the delicacy. Who wants to pin a murder on Ava? Who’s trying to fence diamonds by hiding them in fudge? Become an armchair traveler to Door County in the pages of my books where you can relax and take a tour—and taste some mouth-watering fudge. 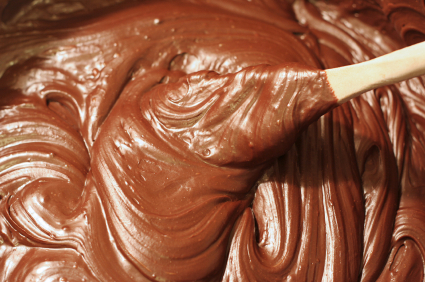 Perhaps you have a favorite fudge recipe or memory about fudge-making to share. Or maybe you’re Belgian, too? Scandanavian? Other? What are your traditions? I look forward to hearing from my readers. 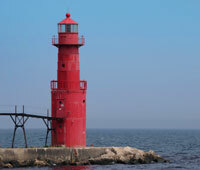 The lighthouse you see on my website’s banner is the scene of a wicked crime in the next installment featuring Ava Oosterling and her Grandpa Gil who run a bait and fudge shop on the shore of Lake Michigan. It’s the First Annual Fudge Festival in Fishers’ Harbor, Wisconsin, and somebody is sending Ava notes threatening her life and the lives of those she loves unless she nixes all the fun. Meanwhile, the eligible bachelors in town including her ex are lined up asking Ava to the dance on Saturday night. Who will she choose? There’s also plenty of trouble from Dillon Rivers’s dog Lucky. And don’t forget the church ladies! They have more meddlesome, er, unique ideas on how to run a fudge shop. 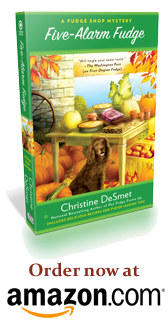 Readers also get to discover a new Fairy Tale Fudge flavor and a recipe for Belgian booyah from a Wisconsin kermis festival I visited. When a visiting European prince asks Ava Oosterling to unearth a priceless, 1800s divinity fudge recipe, the request fans the flames of foul play, with murder marring her Cinderella dreams. Ava and her Grandpa Gil are again mixed up in a fun fudge felony—this time involving romance, royal relatives, and revenge. And of course more yummy, original recipes! Readers had input again on the confections. This caper also delves into the history of the Door County region, including Kewaunee and Brown counties. Did fudge exist here in the 1800s? Ava thinks there might be a connection to the Egyptians; that mystery is explained in the novel. Ava’s also worried about the fires that seem to be following her around, threatening her life and those she loves. She wishes for a miracle—like the one that occurred during the very real Great Fire of 1871. Readers find out alongside Ava what makes that fire so unique in the history of the United States. This novel features our intrepid Ava and friends Pauline and Laura as they trek into southern Door County to where Ava grew up around Brussels and Namur—the heart of Belgian farming country. The plot thickens with handsome Dillon Rivers getting involved in refurbishing the Blue Heron Inn. His dog Lucky Harbor has a key role, too, in sniffing out clues to the killer. And the church ladies are causing all kinds of mischief again at Oosterlings’ Live Bait, Bobbers & Belgian Fudge & Beer. Join them all on the bay side of Lake Michigan in the place known as the Cape Cod of the Midwest. Door County is home to 10 lighthouses—more than any other county in the United States. Several are open to the public. 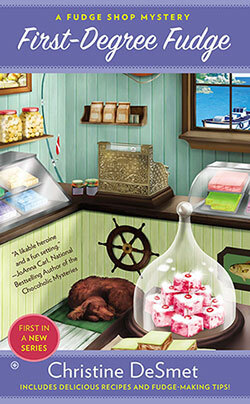 The Fudge Shop Mystery Series will take you to lighthouses for a close, personal look as well as some fictional fun. The county is also home to the largest rural population of Belgians in the United States. Belgians like the Oosterlings settled here in the 1800s to farm, fish, and work in the forestry trades. Belgians flourish in the lower half of the county. Belgians—also called “buffaloes”— brought traditions including booyah (a Belgian soup), boulliabaise (fish stew), and of course—beer, even one called Booyah! In the upper half of Door County—including Washington Island—the Scandinavian influence is felt with historic churches, buildings, and architecture. Door County is quaint in character and proud of it, with two-lane, rural roads that wind through the small towns. Stoplights are rare! Much of the roadway through the county has been designated as part of the Wisconsin Scenic Byway and as a national Scenic Coastal Byway. Breathtaking views of beaches, cliffs, picture-perfect farms and parks overlooking Lake Michigan are yours every season of the year. I’ll see you in Door County for some savory mysteries!